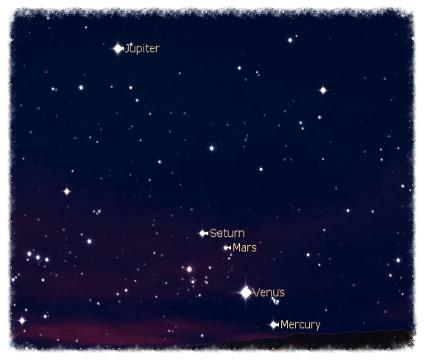 If you look into the night sky, you will see that the planets are aligned on the same path. From our perspective on Earth, the visible planets all move along the same narrow bandwidth, which is what we call the ecliptic. This is ‘true’ from an astronomical viewpoint, but there is an important dimension missing from this picture—that of distance, both distance between the planets and distance between each planet and us on Earth. Jupiter, for example, is about eight times further away from us than is Mars, but this is not something we can grasp from simply looking at the night sky. This two-dimensional view is what we use in the astrology chart. We could say, therefore, that the chart is a false impression of reality. Or, we could contend, as I do, that the two-dimensional perspective is valid in its own right, but that if we add the dimension of distance—the third-dimensional depth—then we have access to an exponentially larger view of reality and of astrology. Let’s put this another way. 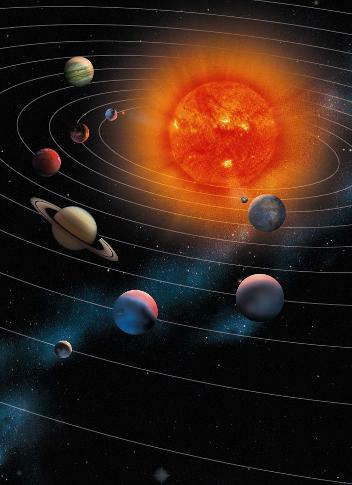 The astrology chart is an two-dimensional astronomical map of the solar system as viewed from Earth, showing the planets on the flat plane of the ecliptic, at an exact moment in time and from an exact location on Earth. The astrology chart is also a map of the psyche—the dictum of ‘as above so below; as within, so without’, which, put more literally, is the essential holographic principle. So, if we add the orbital parameters of the planets to our evaluation of the astrology chart—i.e. if we add the depth, whilst acknowledging the age-old dictum—what happens to our understanding? Astrology is ready to reveal a lot more information. Come and discover a new day for astrology. Astrology, like everything else, is evolving and always has. In the modern era, the paradigm of astrology has greatly advanced due to the emergence of psychology. The cutting edge of psychology, from the contextual or big-picture point of view, is developmental psychology and integral theory. From around the 1950s, pioneers such as Dr Clare Graves recognized that the leading researchers in the field were seeing a stage-by-stage progression of development. There was also an emerging consensus about the nature of each of the stages. Ken Wilber is the flag-bearer for integral theory and has initiated the meta-mapping of the different schools of developmental psychology, along with the Eastern meditation cartography of the psyche and cultural visionary perspectives on human evolution, into a comprehensive system. This integrated system shows very clearly that we progress psychologically through a process of stages, or levels. The human species is a unity of consciousness on a subtle level of reality. All species have generic characteristics that attest to their unity. When we as a species discover a new planet, the species consciousness then awakens to and receives the frequency of that planet. As astrologers have established, a new planet brings new artefacts and new effects into every level of our reality, from culture to science and from art to psychology. The astrological study of planetary discovery is without doubt one of the most exciting endeavours to undertake; the history of everything takes on a whole new rich level of meaning because we can perceive the living creative intelligence of existence in action. A new planetary discovery equates with a new frequency being born within the human collective consciousness. A new frequency becomes available within the ambient environment in which we walk around and imbues and influences everything—every life form, every manufactured object and every human being—albeit, to begin with, mostly unconsciously. Each level of development within the collective filters the new frequency through its own stage of consciousness, as does each individual. The collective paradigms of religion, science and the New Age, for example, translate the emerging higher level through their own perceptional lenses. To illustrate: Pluto Enchantment is the stage of consciousness where we can envisage the different developmental levels that coexist within us. The Pluto frequency can be perceived in diverse ways, from pure darkness to quantum mechanics or the unconscious. But the pure essence of the Pluto frequency is the ‘will of the collective species’, which is a paradox of two primary impulses. On one hand, it is the survival impulse—we need to secure the body, maintain our financial survival and protect our emotional existence. On a collective level, this survival impulse is expressed through human culture as the urge to control and have power over human reality. On the other hand, the simultaneous impulse is to evolve, to change and to grow. The Pluto frequency embraces the paradox of the twin impulses of our species. The work of psychologist Carl Jung helped to expand astrology. Now it is time for the paradigm of astrology to encompass the findings of the larger view within psychology and integral theory of developmental stages. In the language of the Enchantments structure, it is time for astrology to awaken from Neptune Enchantment and to move into Pluto Enchantment. The developmental stages of consciousness—the Enchantments of Life—are mirrored in the structure of the solar system. The orbital domains within the plasmic ocean of space correspond to the structures within the psyche that developmental theory is agreeing upon. It is indeed a new day for astrology.